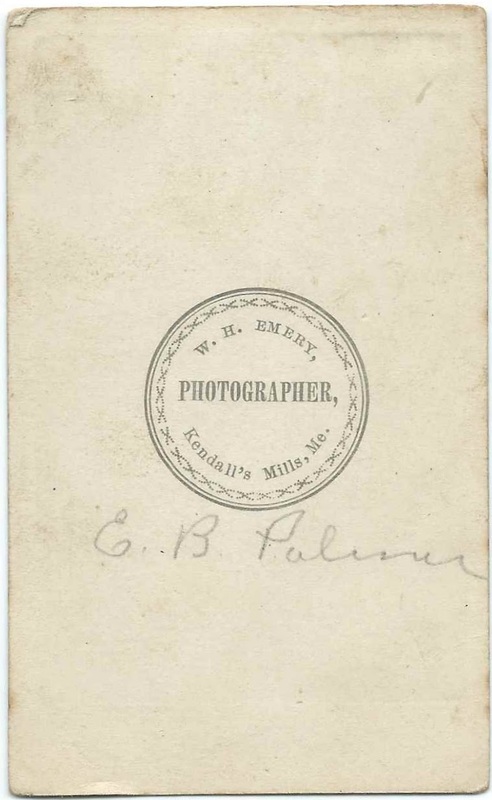 Carte de Visite of a woman identified on the reverse as E. B. Palmer. 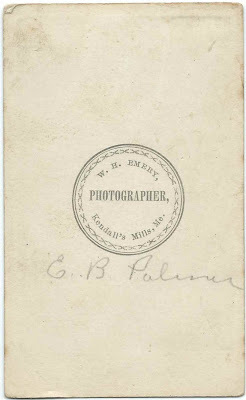 The CDV was made at the studio of W. H. Emery at Kendall's Mills in the town of Fairfield, Maine. Because this CDV was found with one of Sarah E. Palmer of Dover, Maine, I'm assuming that E. B. Palmer was Esther L. (Bemis) Palmer, "Etta", wife of Ira F. Palmer of Dover, Maine. Ira was Sarah's brother; the three of them are buried in the same plot at Dover Cemetery, Dover-Foxcroft, Maine. 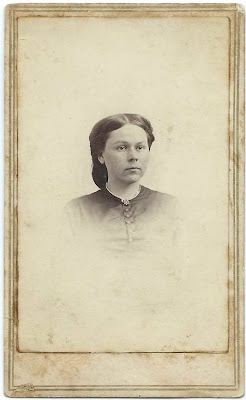 Esther L. Bemis was born September 6, 1844 at Wellington, Maine - or Athens, Maine, according to her DAR application - the daughter of Jacob Bemis and Almeda (Corson) Bemis. On January 20, 1872 at Dover, Maine, Etta married Ira F. Palmer, son of Samuel Palmer and Susan Twombly (Wingate) Palmer. Ira was born at Sebec, Maine, on September 26, 1827. Etta and Ira lived at Dover, Maine; I'm not sure if they had children. Ira died in 1903 and Etta in 1933. From a record in the Faylene Hutton Cemetery Collection, it appears that Ira's sister Sarah Elizabeth Palmer, is buried with them at Dover Cemetery in South Dover-Foxcroft, Maine.